When considering Nintendo's most treasured franchises it can be humbling to consider how many began in the 8-bit NES era or even, in more primitive forms, in Arcade cabinets before then. It can be argued as a wonderful strength or as an area of concern, depending on an individual's opinion or whichever way Nintendo's pendulum of success is swinging. Nintendo has produced new franchises in more recent times, of course, either as spin-offs with existing characters or in occasional download-only games such as Pullblox / Pushmo; the Mii characters first introduced with the Wii also populate a range of fitness and mini-game experiences. When talking about top-tier new IPs that experienced Nintendo fans enjoy the list is rather small — Pikmin is likely to get a mention when picking over those limited options. Nintendo certainly can't be accused of saturating its systems with the franchise — its début on the GameCube in late 2001 (summer 2002 in Europe) was followed up with Pikmin 2 in late 2004; from then onwards it became a series better known for teases, re-releases, delays and confusion. There were nearly nine years before the next full entry arrived, with potential fans having to take satisfaction from Wii iterations of the originals that introduced pointer controls, while rumours of a new entry on Wii swirled and faded with almost every passing E3 presentation. It later emerged that there had also been experiments with a 3DS game in the series, though we suspect that idea was dropped fairly promptly. The delays to the latest game could have been due to multiple factors. One is that it's not the biggest money-spinner for Nintendo, perhaps on account of being a new IP on the struggling GameCube, with Pikmin 2 not hitting the same sales as the original. The Wii, meanwhile, attracted a substantial audience of those new to home console gaming, and Nintendo dedicated resources to those Mii-related projects highlighted previously. Perhaps the biggest factor, however, was Shigeru Miyamoto's personal investment in the series and the latest project. An IP apparently devised from Miyamoto-san's passion for gardening, as a game so closely overseen by the legendary designer it was no doubt impacted by stringent quality assessment. After its full E3 2012 reveal, we had to endure one more delay as Pikmin 3 slipped from the Wii U's launch window to an eventual July / August arrival this year. It's been critically acclaimed, with the only consistent complaint being that it can seem to be over too soon; a reflection of its compulsive playability rather than the game being excessively short, perhaps. Its legacy of no doubt undergoing Wii pre-production and early development is highlighted by the Wii Remote and Nunchuk controls being the easiest, most enjoyable option, though the GamePad still serves as a useful addition to have on the side — in this control scheme it essentially functions as a useful tablet. 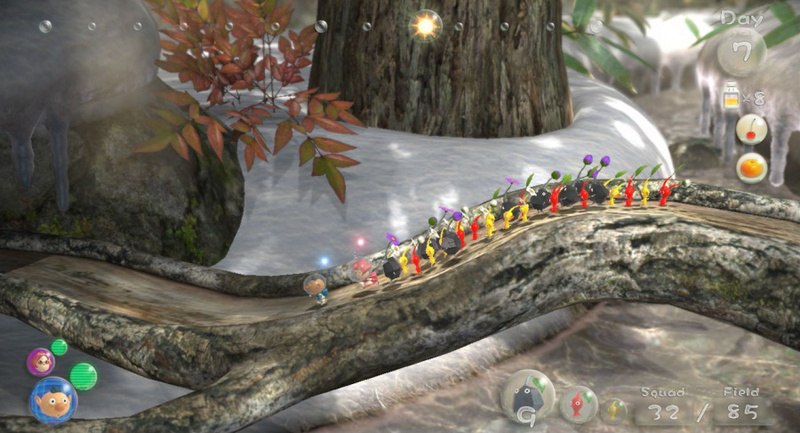 The game itself is full of charm, introducing three new characters to rescue and control, with the second-screen map encouraging multi-tasking with each explorer leading small teams of the delightful little Pikmin. With new types of the little creatures and variety in the environments and challenges, this entry provides a time-limit of sorts by pressuring players to maintain a stock of fruit juice to feed the crew. Memorable 'boss' encounters and a sub-plot to satisfy veteran fans also contribute, while challenges and local multiplayer — competitive and co-op — flesh out the package. It's also a title that highlights the benefits of the Wii U hardware to Nintendo's development teams. Of the first-year of software to grace the system this is one of the best looking games, with attractive locales joined by carefully animated legions of the loyal minions. There are online leaderboards, but more importantly paid-DLC, showing a continuation of Nintendo's limited approach to the model. There have been three packs to date — the first two consist of specific challenges to tackle, but the most recent set is the most expensive and significant in terms of content. There are eight new challenges in all-new stages, while those that upgrade the game's software can also claim a free level — expanding content with DLC is an industry-standard, though will likely lead to as many critics as supporters. The value of the day one retail game is vital in this debate, and each individual will have their own view. Ultimately, however, Pikmin 3 was one of the best games on Wii U this year, with Nintendo no doubt hoping it'll have long-term appeal and accumulate sales throughout the system's lifespan. It stands out as an epitome of why some gamers just have to own Nintendo systems; it's a game perhaps unlike those found elsewhere. Shigeru Miyamoto's passion for the series gives it a good chance of continuing, though we'd hope it won't be another nine years before another title arrives. If you're yet to try Pikmin 3 on the Wii U, meanwhile, then it should be high up on your wishlist. 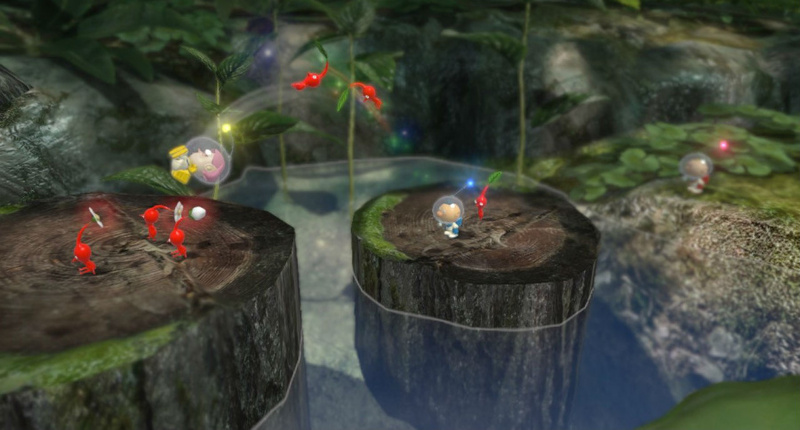 To learn more about the Pikmin series, check out our brief history of the franchise. I wish I would of gotten a GameCube years ago... playing Pikmin and the original animal crossing would of be pretty fun. Pushmo was also a great new franchise. Such a pity its successor Crashmo was really not all that good. I wonder if there is a way of doing a real Pushmo 2 that brings something new without spoiling the original idea. Pikmin 3 is an excellent game, I got into Pikmin after the New Play Control! version of the first game arrived in the US and bought the second one, knowing the third would be an improvement to the formula, and I feel like I was right in assuming that. @RetroRider Try New Play Control on Wii for Pikmin! The controls are far better. PS: fanboys are so small they doesnt count. sorry. Pikmin 3 is my most played game and certainly my GOTY. I feel that like the original its underrated by many but loved by those who own it. This should be a PC only game. Its doesn't fit well on a console at all. I've only played the original Pikmin(Wii version) and i absotootly' loved it. It's one of those games that i thought i wouldn't end up liking, but boy was I wrong! I've got a copy of Pikmin 2 on the Wii and I know i'll be getting 3 for christmas. These games sell poorly because people aren't willing to give them a chance, These days, new original and great ideas(Pikmin, Elebits, Zack & Wiki ect)are crumbling in terms of sales. While something as lazy & safe as New Super Mario Plastic Wallpaper bros.Wii rakes in the koopa coins. Now that development costs are rising even higher now developers won't even want to take risks....The Indie scene is where you're going to see franchises(hopefully) being dished out. Shovel Knight taking the number 1 spot on my list. I have loved all three Pikmin games, although I started to play them in the Wii era. Very charming, challenging and refreshing. I find awesome how good fruits look in HD, and it had to be a game like this to make treasures out of mundane stuff like tangerines. Excellent game, but I believe the criticism is well founded. It was too short, but I loved every minute of the campaign. It's a shame there is only one save slot. Another campaign or online multiplayer would be insta-buy DLC for me. @SavoirFaire I definitely agree that the campaign is too short, but the challenges are really fun. I haven't bought all the DLC, but I bought the $4.99 released at the beginning of December and it's really good. Well worth the $4.99. It's really too bad this gem of an experience has been overlooked this year. Maybe not here, but I'll be shocked if I hear much Pikmin 3 love on any general gaming site/podcast end-of-year wrap-up, when it truly deserves the praise. Nothing else like it out there not called Pikmin 1 or 2. And those fruits! Love to see what Nintendo can do finally in HD. I just hope we get another one this generation. And if we do, I hope it has the same relationship with 3 as 2 did with 1: stuffed with several times more content and filled with insane, more "arcadey" and chaotic enemies and hazards. 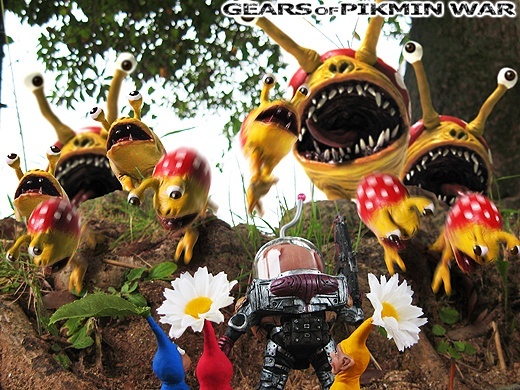 The only way Pikmin 4 will sell well is if they arm the Pikmin with submachine guns & grenade launchers, soup them up in commando gear + mech suits, turn the Flowers/leaves on their heads into Pirate Daggers, allow for PikBlood & body dismemberment, give them pikMAN-stubble and have it set in Master Chief's backyard, aka > a post apocalyptic barren wast land with rotten fruit. @minotaurgamer The only thing nobody asked for is your trolling. Get outta here. ??? If you're only going to release games people ask for, there'd be like 3 games on any Nintendo console. Zelda, Mario, Metroid. That's it. What a cheap reply, "A game nobody asked for or wanted". Are you kidding me? You could say that about ANY game that's relatively new. Nintendo's job is to release FUN games, whether we ask for them or not. Most of my favorite games were not something I asked for. Nobody ASKED for a first person Metroid. But now that's all anybody wants. As for no one caring, I don't know where you got that from. There's plenty of people that care about Pikmin 3, many of whom had never played a Pikmin game before. Take all that negativity elsewhere. PS: Being a fan of something doesn't make someone a fanboy. Ridiculing others for there preferences and games of choice, however, does. Grow up. Probably my favourite game of the year. Marvellous. It took me a little while to get into Pikmin 3 due to the Wii Remote, Nunchuk and Gamepad combination, but as soon as I got the workflow down I absolutely loved the experience. The attention to detail in Pikmin 3 was incredible, I especially liked the descriptions of the fruit (not just their given names). Wonderful stuff. I really hated the ending. I mean really hated it, ruined whole experience for me. Why just have it end like that without a continuation option? Why not have a warning? Yes I know I can go back and replay it but why should I have to battle the final boss again? Why cant we just collect the fruit, you know the reason we came to the planet in the first place? 4 months later and Im still annoyed. I still need to pick up this gorgeous looking game! @minotaurgamer I'm curious......what's your point? That the game isn't good because it isn't popular? or that fan shouldn't like it because it doesn't sell 30 million copies? This site is called nintendolife, people are going to want pikmin coverage. @Captain_Gonru - "to play more of what I enjoyed." We did just re-order (not the right word) Sonic from Gamefly as now that we have the patch my kid wants to finish it. We were all annoyed at no extra life for 100 rings but they fixed it so were over it. Free month of Gamely for $1 doesn't hurt. This is high on my list of games to get once I have a Wii U. I have the original on Gamecube and the Wii version as well. Great combination of gameplay, sound, and animation. This is gonna sound odd, but Pikmin 3 has one of the best title screens of all time! So calm and inviting, i love the music and Pikmin shuffling about in the background. I enjoyed the game alot, up until the final boss, where it felt i was battling the camera more than anything! @demonroach with the first 2 installments on GameCube, I agree 100%. This type of a game is silly on a standard console controller. As primarily a PC gamer myself, I find the Wiimote+ an excellent mouse alternative. 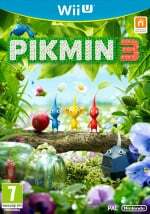 While a mouse Will be superior in FPS's, this particular game felt natural with the Wii mote, and I'm unsure if the mouse would be better for Pikmin 3. I think the mouse would make it way too easy to play, effectively killing the enjoyment of the game.. The level of challenge feels just perfect with the Wiimote. This game is the reason why I want a Wii U! @lippe_flamarion why wait any longer? It has enough interesting exclusives to keep you busy for the next 6+ months. @MeowGravy I agree 100% .... It's both gorgeous and peaceful. When I first downloaded the game, I left that screen on while cooking dinner. I just wish there was a way to keep the intro of the campaign from playing. @MeowGravy And the ending/credits were quite nice as well. I actually downloading the soundtrack for the title screen 2 days before I got the game. So short, but DLC and multi-mayhem makes up for it. I'd prefer a return to the Pikmin 2 type. @minotaurgamer You're making me sad right now. Probably my favorite game on the Wii U, though I still haven't finished 3D World. I'll still be waiting for Call of Duty Ghosts and Battlefield 4. I never played Pikmin before I bought Pikmin 3 . . . now I am addicted!!!! The thing is with Pushmo there was a puzzle creator and users mad TONS of really clever and artistic levels that could be read in from the computer screen via QR code. So really Pushmo has almost unlimited levels. They needed to do something different - but the game was pretty much perfect as it was, and changing it up just harmed it. In this case I think maybe the single release was the only possibility. There might be a way of making a true follow-on but I can't think what it would be. This was my first Pikmin game and I loved it! 9.5 from me. Visuals are great, gameplay is amazing, but took off a half point for length and I would have preferred no time limit or an unlockable option to do so. I guess I was the only one with slowdown issues. It was bad enough that I never even finished. I opened up the final boss area, but didn't even see it. Beautiful game, but I prefer the first two. Pikmin 3 was one of the best games I've ever played. I remember picking up Pikmin for the Gamecube when I was 12. I had seen commercials for it and was instantly intrigued. It was a very exciting game, I loved the gameplay instantly, and the replay value was (and still is) possibly the best out of any game I had ever played. At that time, my GCN library consisted of Melee, Luigi's Mansion and Pikmin. All three were treasures. Pikmin 3 has done an incredible job at continuing the legacy, and honing the controls masterfully. I have only played Pikmin Wii once, and I can honestly say, the GCN controls were MUCH better. However they fixed that in P3. Pikmin 3 was so anticipated before its launch...but now that it's out, it's like... no-one cares. Everyone's talking about Wind Waker and A Link Between Worlds and Pokémon X & Y... Pikmin is just kind of forgotten by the majority of the gaming community. I guess it's always been niche though huh.